Apple-Twitter Partnership a Win-Win: Why Didn’t Facebook Take the Deal? Today, Apple and Twitter unveiled a new partnership that gives users the option to link accounts and port activity between the two services. It’s a huge win for Apple and Twitter, so why didn’t Facebook take the deal? 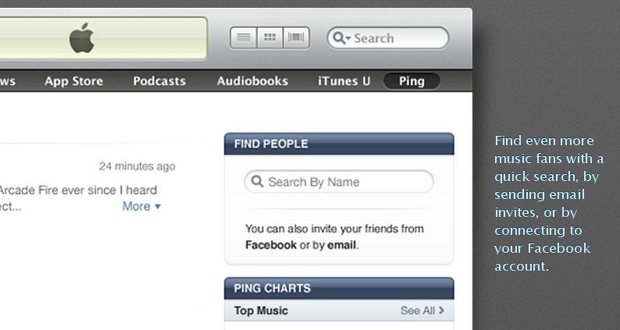 Today, Apple’s Ping service unveiled a new partnership with Twitter, which we’re dying to call Twing (or Pitter). The deal gives Twitter users the option to link their accounts to Ping, iTunes’ troubled social network, and port activity between the two services. It’s a huge win for both Apple and Twitter, but the real question is: why didn’t Facebook take the deal? But after a reported 18 months of negotiations between Apple and Facebook, the deal crumbled. Why? Because of Facebook’s demands for “onerous terms,” according to Steve Jobs. Critics might argue Facebook made the right move. After all, giving Apple access to its half-billion users is a lot to stomach. On the other hand, Mark Zuckerberg and Co. may have lost out on something more valuable: user behavior. Apple, through iTunes, has created a community of very willing customers: Users let Apple store their credit card information, and are eager to buy apps and songs and movies and books. No social network has reached that point, and Apple could be the key. After today’s announcement, we’ll be closely monitoring whether iTunes-like user behavior begins to migrate to Twitter with the help of linked accounts. Twitter is giving Apple access to its millions of users and allowing an embedded iTunes window with song previews, Ping-related activity, and links to the iTunes store. In exchange, Twitter will have the opportunity to foster an environment where users feel comfortable spending money on Twitter. Will purchases on Twitter–be it from ads or friends’ tweets–soon be just a click or two away? A source tells Fast Company that consumer credit card information will still be stored at Apple, not Twitter, even with linked accounts. But that doesn’t mean Twitter won’t gain a slice of the pie from iTunes. Twitter declined to comment on the financials of the partnership, but there’s a strong likelihood revenue-sharing was part of the deal. Imagine if Twitter earned a cut on every song or album purchased from iTunes through Twitter? Now imagine what other partners the company could involve with linked accounts: Amazon, eBay, etc. Perhaps that is Twitter’s hope, and why the company was willing to give Apple so much in a deal that, on the surface, only appears to benefit Apple. As for Facebook, giving Apple access to its massive user base and screen real estate (with links advertising for users to spend money at a different company) may have been too much of a concession. Facebook is already pulling in huge revenues–far more than Twitter, which has been struggling to monetize–and its users have begun to demonstrate a willingness to spend money on the social network. And maybe for Apple and Ping, Twitter was just the more appropriate fit. With its minimalist two-panel design, Twitter has room for iTunes. On Facebook, among Places and Deals and photo albums and FarmVille, Ping might have gotten lost in the clutter.